Our 6th year anniversary week starts on Monday 7th April, 2014. 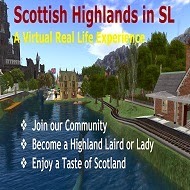 The original idea for the Highlands of Scotland were started by Gerald Wylie 7 years ago as an inworld Nessie Hunt Game. However, on 22 March 2008 he decided there was a wee space for a pub. This was set up and on Friday 11th April 2008 our official opening of The Loch Ness Inn (Nessie’s Nook) was celebrated. We have always used Aldouri Castle for this Second Life Inn although the building has been changed to suit modern day SL. Although the Sims changed over the years, we have kept the Warm Highland Welcome. Friendly Community Feeling and encourage our friends to feel at home with us. We moved to the new sims on 8th April 2009 and have been there ever since. The Inn is the perfect ‘local pub’ for most of us and we are looking forward to our full week of celebrations starting on Monday 7th and ending on Sunday 13th with our Grand Highland Ball and Anniversary Ceilidh. 13:00 DJ Doug with Silli Pipers and Special Guests. We also have our breakfast with Maxx and afternoons with Leanne continuing throughout so also watch notices and our calendar.